Marshall hasn’t been been shy about capitalizing on its legacy. The legendary English amplifier company has plastered its name on cans of beer and a line of refrigerators. It’s not the most crass branding we’ve seen, but it’s pretty damn silly. At first glance, the same can be said for its line of bluetooth speakers and headphones, save for one important thing: they’re actually quite good. It’s been several years since the company branched out into consumer electronics, and along the way, it’s been remarkably consistent with the products that bear its iconic cursive logo. Announced this summer at IFA, the Kilburn II doesn’t stray far from the familiar Marshall amplifier style. 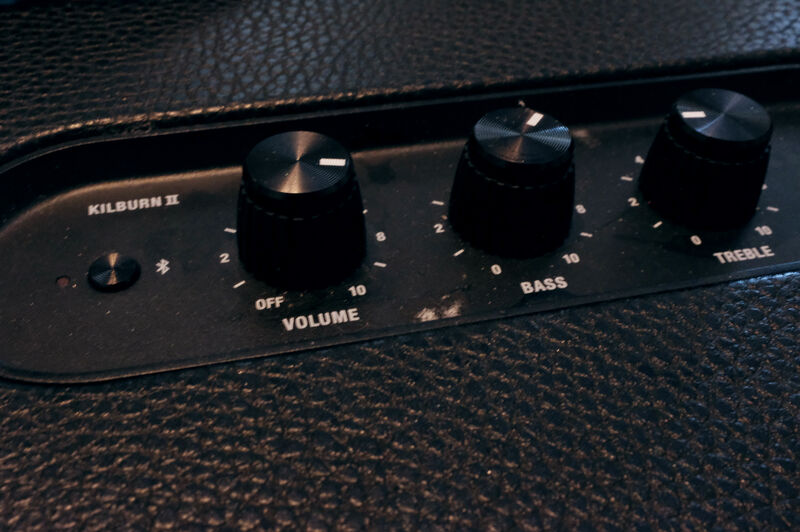 In fact, you’d be forgiven if you mistook the thing for a practice amp. Instead, it’s just a solidly built bluetooth speaker with a rubberized faux leather design that can take some serious bumps. It’s further ruggedized by way of a chainlink metallic grille up front. The speaker is water resistant, so you can take it outside without much concern. That said, if you need a true all-weather speaker, I’d recommend looking at something from JBL. The Kilburn isn’t going to go swimming with you, but it’ll withstand a little spilt whiskey. The sound quality is decent for speaker of this size. It’s not the best sound I’ve heard out of a bluetooth speaker, but if you’re looking for something portable to fill up a small room, it’s a pretty solid choice, and the treble and bass knobs up top will help you find find the perfect medium. Unlike most bluetooth speakers, the Kilburn requires a proprietary plug for charging. That means no microUSB/USB-C. That’s understandable though, given the massive on-board battery, which should give more than 20 hours of life on a charge, watching the series of red bars creep down in the meantime. At $299, it’s not a cheap bluetooth speaker, but it’s solid as far as the price point goes. It’s not going to replace your audiophile sound system any time soon, but at least it will look nice sitting next to your vinyl collection.